Description: Carpet Foam Pad - Roadkill 12sq-ft (1/pack 32" x 54") RoadKill Carpet Pad was specifically designed to eliminate road noise from floorboards and transmission humps. 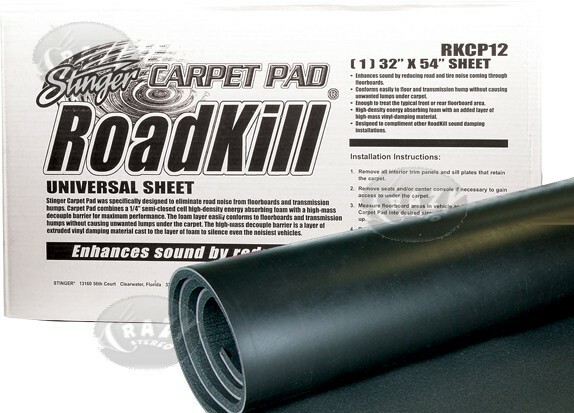 RoadKill Carpet Pad combines semi-closed cell high density energy absorbing foam with a high-mass butyl vinyl decoupling layer for maximum performance. This combination provides for heavy damping properties over a wide range of frequencies and also mass loads the surface it is applied to suppress vibrations. 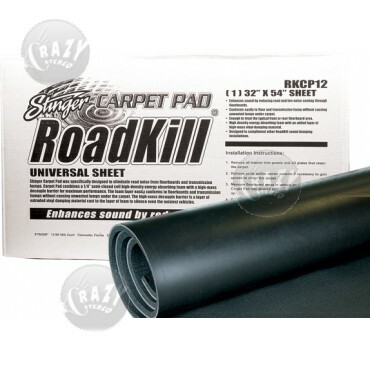 RoadKill Carpet Pad is easily cut to size using a utility knife or heavy scissors. RoadKill Carpet Pad is does not require adhesive and is designed to be applied under factory carpet and will provide damping as well as a cushioned feel found in luxury style vehicles. Installation is as easy as cutting to size and sliding under the existing carpet. 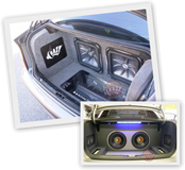 Utilization of vehicle floor mats as a template can speed installation even more. Used anywhere high damping is needed.